Finding cheap kids clothes can be challenging, so having to budget for a new wardrobe is essential. If you have multiple kids, then you know all too well the burden of coming up with enough cash to buy all of the clothes needed for all year long. Many stores offer buy one get one free offers throughout the year on jeans, shirts, and even shoes. While you may not think your child needs so many clothing items all at once, then consider buying the next size up. This way when you need larger clothes for your kids, you will already have some stored away at home without having to rush out and spend money impulsively or out of desperation. You will feel so good to have these extras on hand! Pay close attention to the deals that take place throughout the year on childrens clothing. You will be amazed at all the savings you can get. Of course the first place to look when you arrive at a retail store is the discount and clearance sale racks. These clothing bargains are generally placed at the back of the store. You can literally purchase seasonal items such as, swimsuits at the end of summer for rock bottom prices instead of $10 or $20 a piece. This type of out of season buying is what you want to start doing all the time. It will save you so much money! Winter jackets can be a costly purchase, and can eat at the pocket book. 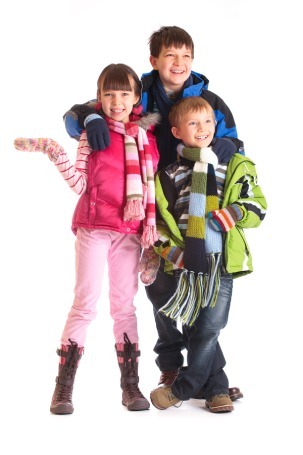 Again the trick is to buy extra coats for your kids at the end of the winter season in the next size up and avoid those high prices. The same goes for summer clothing such as sandals and shorts. These summer items go on sale as school approaches and you can buy larger sizes to keep until the next summer. You can use storage crates for all your bargains, and that way the clothes will stay in nice condition until you need them. More great items to buy on sale and at the end of the season would be: sweaters, boots, winter scarves, hats, gloves, mittens, and wool socks. Now, let's talk about some great tips for purchasing cheap kids clothes. Keep your kid's closets cleaned of clothing that doesn't fit, then you will know what is needed. Make a list of all your kid's clothing needs and what you are looking for including sizes. Keep a close eye on sale pages in the major newspapers on Wednesdays and Sundays. Avoid trendy colors and designs that will be out of style when your child will be wearing them. Buy classic and basic styles that will stand the test of time. Buy The best quality for the best price you can afford. Consider buying nice clothes for a good price and take good care of them, because you then have the opion to resell them at consignment shops, and online auction sites. This means even more money in your pocket! Last but not least have fun shopping for cheap kids clothes for your children. It is fun to be frugal and you will so good about the savings.